The larger pharmaceutical and medical device manufacturing companies are increasingly realising that by developing novel drug delivery mechanisms, the life of a drug can be significantly extended. This, combined with the development of other complex medical devices requiring volume-production methods, has led to an increase in the use of combined assembly and testing systems. These systems integrate the use of assembly processes with sophisticated testing procedures that require specialist automated assembly and data handling. This article outlines the key issues to address when sourcing this equipment. It is often difficult for system integrators to properly capture the manufacturers requirements for an automated production system. Sometimes, this is because a minimal specification is supplied and essential information has to be coaxed out of the manufacturer. At the other extreme, the enquiry consists of two pages of technical specifications hidden within a forest of commercial, contractual and general specifications, which confuse the assessment of the requirements. When considering an automated production process, it can be difficult to estimate peak volumes. This is particularly the case with a new product start-up when the marketing data is variable. The techniques used for automated assembly may be considerably different for manufacturing 1 part/min on a single day shift compared with 1 part/s in a 24/7 regime. Although difficult to assess, it is essential to have a clear goal related to production volumes. The allowed time to produce one part, for example,3/s or 1/min. A completed assembly drawing or sketch. Component drawings with tolerances, if possible. A description of the method of presentation of each component part to the system, for example, loose in a box, on a conveyor, pumped or in a tray. Details of how the finished assemblies are to be presented or packaged. Next the requirements for product identification and verification can be evaluated. The extent of work in this area will depend on the cleanliness classification and validation requirements of the production environment. Some processes do not require verification of component parts as they enter the automated system. Most subcomponents that carry a drug must be uniquely identified and this must be recorded as the unit enters the process. More often today, parts not containing drugs must be checked as being present using Poka Yoke techniques.Poka Yoke is Japanese for mistake proofing that involves 100% automatic sensing of all components individually and together to check the assembly. A clear description of how the parts can be identified and how the information is to be logged or verified is essential to the design of the control elements of the automated system. Automated processes are moving to 100% traceability of the finished parts, therefore, labeling and data-storage requirements need to be defined and communicated to the system integrator. The control information specifically relevant to data handling and verification will require knowledge of automated manufacturing practices, GAMP 4,and the requirements of the Food and Drug Administrations Title 21 Code of Federal Regulations, Part 11. 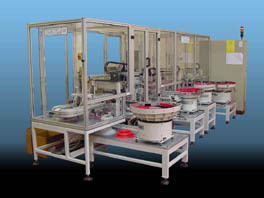 A considerable investment in time is required to properly understand the specific requirements and to formulate the most suitable solution.Even with a clear route to communication between the system integrator and the manufacturer, this can run into many months of work for both sides just to be able to determine the correct solution.Before a dialogue begins, it is important that the manufacturer satisfies himself that the potential supplier of the equipment is capable of working to the required standards.Quality systems standards such as ISO 9001/2000 and quality system requirements,QS 9000,are useful benchmarks for selecting system integrators with experience in industries outside the medical manufacturing industry. When sourcing an integrated system, manufacturers may also wish to investigate the extent to which the system integrator performs the separate aspects of design,manufacture and assembly in relation to the mechanical,electrical and software/control aspects of the project. Most manufacturers would like all of these elements to be directly performed by permanent staff within the system integrators company to ensure the timely completion and proper support of the machine or system once it is in service. Some system integrators subcontract major elements of software,control panel wiring or manufactured parts.In addition, a supplier must be able to support the system from concept,through manufacture, assembly,capability/commissioning and into production.